Despite a deadly equine virus that spread to Idaho from a cutting-horse competition in Utah, the Sawtooth Rangers riding club plans to hold its annual Days of the Old West Rodeo on the weekend of the Fourth of July in Hailey. "It's going to take place," said Sawtooth Rangers President Bill Bobbitt. 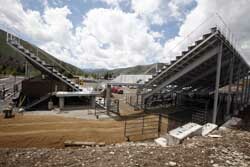 Bobbitt met with livestock contractors recently at the new arena under construction in Hailey. He said no one expressed concern about bringing horses, bulls and calves to town, despite the fact that rodeos have been canceled or postponed elsewhere in the West due to the outbreak of the virus. "There have not been any new cases in two weeks, so we are planning to proceed as planned," he said. "The entry numbers are looking good, but we might be down because of the price of fuel." An equine herpes virus (EHV-1) spread to several Western states last month from the National Cutting Horse Association Western National Championships, held from April 30 to May 8, in Ogden, Utah. About 400 horses from several states competed at the event, including several from the Wood River Valley. A news release distributed by the U.S. Department of Agriculture in May states that "virus symptoms to look out for are severe neurological disorders, including poor coordination and lethargy. The virus is easily spread by airborne transmission, horse-to-horse contact and by contact with nasal secretions on equipment, tack, feed and other surfaces. People can spread the virus to horses by means of contaminated hands, clothing, shoes and vehicles. Currently, there is no equine vaccine for protection against the neurological strain of the virus." As of June 7, 33 cases of the virus had been confirmed in Western states, resulting in 12 horse deaths, said Hailey-based equine veterinarian Steve Fairbrother. Fairbrother said three cases of the virus have been confirmed in the Wood River Valley, and that all three horses have been quarantined in a barn south of Bellevue. "We haven't seen the onslaught of cases we were worried about, so that's the good news," Fairbrother said. "They've completely quarantined their barn. So far, it looks like it's been contained." Fairbrother said "bio-security" measures are in effect at regional equestrian events due to the outbreak. Those include washing hands, changing clothes and even washing tires of trucks and trailers after handling horses. He said the virus can be spread from horse to horse at a distance of up to 30 feet, but the likelihood of cutting horses transmitting the virus to rodeo livestock is minimal. "Rodeo is a completely different event. Cutting barns are pretty insular," he said. Bobbitt said horse owners are mostly keeping their horses stabled until the virus danger blows over. "Keeping them in will help it blow over faster," he said.